Not that I need a reason for baking a lemon cake (we all know that) but to be honest this recipe got my attention because of the addition of finely ground oats to the batter – what might seem like a plan to trick picky eaters into eating more fiber turned out to be one of the best cakes I’ve made: great texture, moist and oh, so delicious. I can’t remember how I got to this link, but I found it so amazing I had to share it with you: even I, someone who absolutely hates spoilers, clicked throughout the 50 movies and found several favorites of mine there. Just remember: spoilers galore. Preheat the oven to 180°C/350°F. Butter a 20cm (8in) square cake pan. Using an electric mixer, beat the sugar with the butter, oil and lemon zest until pale and fluffy. Beat in the eggs, one at a time. Beat in the vanilla. Sift the flour, baking powder and salt together in a medium bowl. Whisk the hot water into the egg mixture until smooth, then fold in sifted ingredients, the oats and the poppy seeds. Pour into the prepared pan, and smooth the top. Bake for 50 minutes, or until golden and a skewer comes out clean. As soon as the cake is out of the oven, make the syrup: heat the sugar with the lemon juice until dissolved, poke a skewer deep into the cake dozens of times, then spoon all the syrup over the top. Cool completely in the pan over a wire rack. Oats sound like a brilliant idea, and something I haven't thought of. I love lemon with poppy seed. This cake looks delicious. When I hear lemon I'm very interested... The addition of oats is a bit unusual, but very interesting. I can't wait to try it. Oh yes, oats do make cakes moist, breads too! And those picky eaters won't even know it's there. Looks so good. I love lemon and poppyseed anything. Will have to try it out. When you blitz your oats in the food processor you have oat flour. Some bulk sections of groceries sell it already turned into flour but I find the price per pound is less if you do it yourself. I have put oat flour in many recipes and they come out fantastic. I'm going to try this one since they are my favorite flavors. 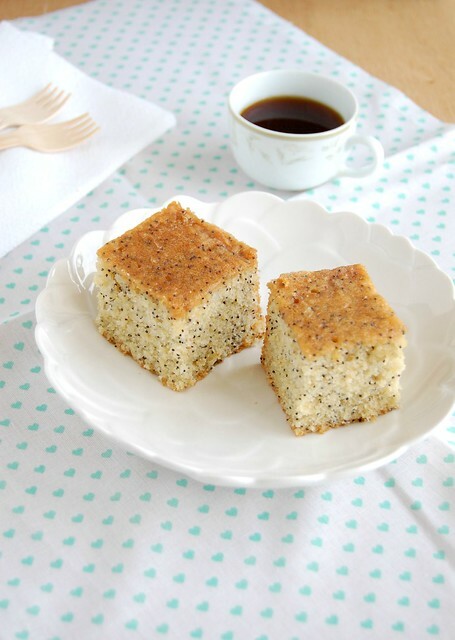 I think I'll also substitute oat flour for regular in my favorite lemon poppyseed muffins! I've never made [or baked with] oat flour. I'll have to try it. The cake looks delicious! Hey, Sharon, I'd rather process the oats because I rarely use oat flour and it spoils so easily. But tks for the tip! I wouldn't mind having some of this with my morning coffee.